Books are a weakness of mine. I find it hard to part with them once I’ve read them. They just look so pretty on the bookcase! But they take up space, and if you want to buy new books, you have to part with the old ones. Books are quite straightforward to sell. If you’ve got textbooks Amazon and eBay are a great place to start, textbooks tend to be quite expensive and some editions will sell for a lot of money. Novels are harder to sell because they are mass produced, so you likely won’t make that much money selling them. If you decide to sell novels, you may make more money selling books as a collection than selling as singles. If you don’t fancy navigating the wilds of auction selling, there are plenty of companies that will take books off your hands in bulk. Most of these options give you a way to check how much you’ll make before selling, make sure to pay attention as you may only be offered a few pence for each of your books. There are lots of links to selling sites at the end of this article for you to explore. If you don’t want to sell you can donate books to a school, library or charity shop. It’s always a good idea to check with the shop before donating. Book swapping is a great way to exchange old books for new books. All you need to do is make friends with other readers and agree to swap books when you are done. I used to do this with about three friends and once a book had done the rounds we donated it to a charity shop. You could also set up a book swap in your school, office, church or any other group you belong to. Simply put books you don’t want on a bookshelf and let others take them for free. Books contain many adventures, but what if your book went on an adventure of its own? Similar to the book swapping option, Book Crossing encourages you to send your books out into the wild, only you’ll be able to track where they’ve been via a number of journal entries left by whoever is reading them at the time. Two new books showed up in the Little Free Library bearing BookCrossing Labels last night. I registered them and released them back into the wild. If you find them, please take a moment to log them into BookCrossing so folks can see where they travel. Several years ago, my mom found a book with a curious label in it. The label said it was a “BookCrossing” book. My mom doesn’t have a computer, so I registered the book and I was off and running. I think this idea is so cool. Each book has a unique BCID (BookCrossing ID). By entering that number at http://www.bookcrossing.com/ you can see where the book has been – and then you can track where it goes. If you’re familiar with Where’s George? for dollar bills, this is similar. Many other Little Free Libraries are connected with BookCrossing and I thought it would be fun to have my Greenbriar Little Free Library #33664 play along, too. 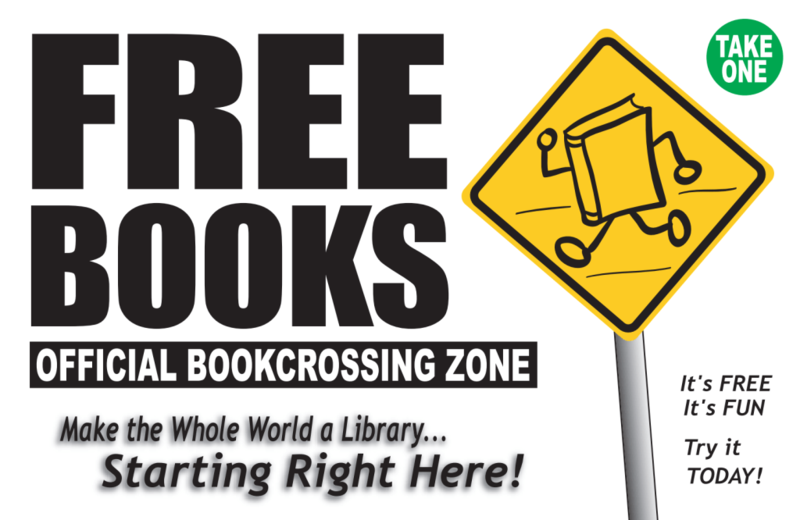 The Greenbriar Little Free Library #33664 is an official BookCrossing Zone. BookCrossing, Books, video, Where's George? While the day’s origins may be shrouded in mystery and rumor, the books themselves are not. Started from carving on stone tablets, the book was designed to make portable the writings and drawings of those that could not carry around stone tablets. Originally it was parchment or vellum (calf skin, in case you were wondering)was bound tightly with a wooden cover. Often the wooden cover was tightly wrapped in leather to prevent the wood from getting wet and had clasps or straps to hold it shut. In the more modern age, printing capabilities made books cheaper, and easier, to print. The printing press, the typewriter, and the computer all had an effect on the market of books. But more so than most, is the upsurge in electronic devices that can be used to read on. Computers, tablets, and most cell phones now have the ability to read books, making it that much easier to carry around a small library to enjoy not matter where you are. In order to truly appreciate Book Lovers Day, one must only find a story and read it. Maybe you wish to dive into the unknown with a good mystery, or see magic in a high fantasy setting, or be enthralled in a steamy romance. The individual genre of your reading is not the big piece of this, just that you do read it. Maybe a visit to your local library is in order? After all public libraries existed even way back in the Middle Ages, but they didn’t really let many folks take books home. The librarians in those days chained books to shelves or desks in order to prevent theft of the carefully hand written tomes. Many librarians will gladly help you find a title to read, giving a brief explanation on what it is about if they have read it, or giving it a little flip and reading about it quickly in the synopsis. But no matter your preference, if you read it at home with a cup of tea, share a book meeting with friends or go to the library and make use of the wonderful pieces on those shelves, just enjoy your reading, revel in the book and find a way to read during Book Lovers Day!